A Lake Erie algal bloom captured by MERIS in Oct. 2011. 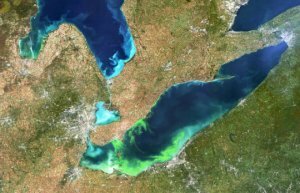 Of the many weather-related factors that contribute to harmful algal blooms (HABs) in Lake Erie, a new study has identified one as most important: the wind. Over a 10-year period in Lake Erie, wind speed contributed more consistently to HABs than sunshine or even precipitation, researchers at The Ohio State University and their colleagues found. The ongoing study is unusual, in that researchers are building the first detailed analyses of how the various environmental factors influence each other - in the context of satellite studies of Lake Erie. 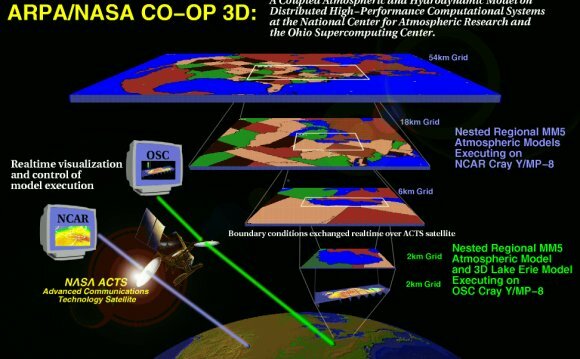 They gave their early results at the American Geophysical Union meeting on Dec. 17. To C.K. Shum, Distinguished University Scholar and professor of geodetic science at Ohio State, the finding "underscores the need for environmental agencies to incorporate the threat of extreme weather events caused by climate change into future algae mitigation strategies." Where other studies have linked weather phenomena to HABs, this study goes a step further to look at how environmental drivers impact each other, and "ranks" them by their relative importance in promoting HABs, said Song Liang, formerly of Ohio State and now an associate professor of environmental and global health at the University of Florida. "What surprised us the most was how the impact of nonweather factors, such as nitrogen and phosphorus pollution, varied strongly by season, while weather factors remained consistently important throughout the year, " he said. Researchers have long known that high nitrogen and phosphorus levels are the actual causes of HABs, which choke freshwater ecosystems and render the water toxic. But when it comes to the various environmental factors that can amplify the amount of these nutrients in the water, or aid or hamper the spread of algae, the relationships are much more complex. "One of the objectives of this project is investigating historical patterns of harmful algal blooms and their linkage to water quality and environmental factors, " explained project leader Jiyoung Lee, associate professor of environmental health sciences at Ohio State. "By doing this, we can better understand and predict the future of HABs and water safety in the Lake Erie community with the impact of changing climate and environmental factors." Liang and his group analyzed nine environmental factors, including solar radiation, wind speed, precipitation, nitrogen concentration, water temperature and water quality in Lake Erie from 2002 to 2012. Then the larger research team used data from the sensor onboard the European Space Agency's Envisat satellite MEdium Resolution Imaging Spectrometer (MERIS) to examine how the color of the lake water changed during those years - an indication of the concentration of the toxic blue-green algae present in HABs. The researchers examined the environmental drivers by season, and found that wind speed affected the spread of algal blooms consistently throughout spring, summer and fall. Seasons of low winds led to larger blooms. That's because when wind speed is low, lake water is more still, and algae can more easily float to the top and form thick mats that spread along the lake surface. Sunlight, meanwhile, was important in the spring and summer as a source of energy for the algae. Precipitation was very important in the summer and the winter, when rains and melting snow boosted runoff and delivered nitrogen and phosphorus, which algae use as food sources, to the lake. As the project continues, the researchers hope to get a better understanding of how the variables relate to each other, and explore the notion of weather and climate as factors in a kind of "early warning system" for HABs. The above post is reprinted from materials provided by Ohio State University. The original item was written by Pam Frost Gorder. Note: Materials may be edited for content and length. Ohio State University. "Top weather conditions that amplify Lake Erie algal blooms revealed." ScienceDaily. ScienceDaily, 17 December 2014. .